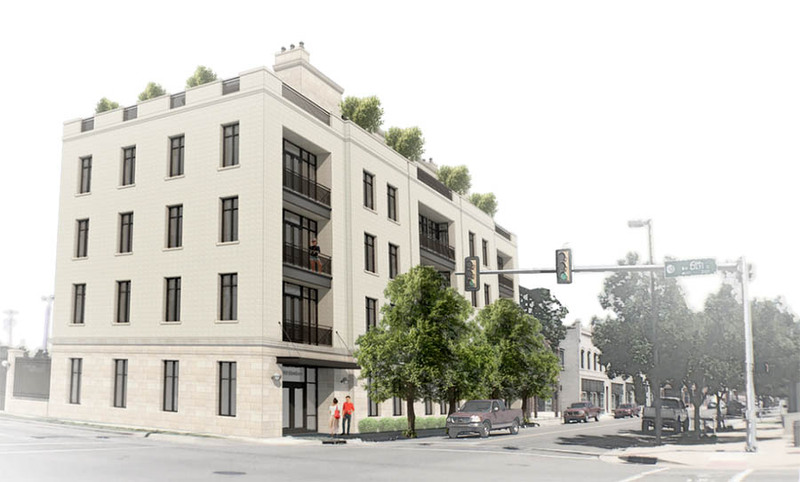 Oklahoman reporting that Norman developer Brent Swift is planning a 5-story residential structure on the NW corner of Hudson and NW 6th. Commercial and parking on the ground floor, 3 units each on floors 2, 3 and 4 and a penthouse on the 5th. Brent Swift has done some amazing projects primarily in Norman but also 7 at Crown Heights. Wish someone would do something with all the surface lots directly to the west. Great infill. There's room for about 50 more projects like this one around the core. There's supposedly going to be information about this project at tonight's H&8TH, I'll see if I can find it and report back. Are the mature trees on the corner going away? Looking at the renderings, though, I don't think they're going to make it. All I was able to find at H&8th last week was the following, but I forgot to followup and check out the URL. They released floor plans and pricing today. $/sf is in line with most for sale living in the area. 4 units are already reserved. Prices are right around $310 / SF. I'm sure the penthouse is higher. So these are for own and not rent? I'm particularly curious about who the commercial tenant spaces are reserved for. Wow, 1500 sq ft rooftop terrace for the penthouse unit? That price is going to make a run at the one in First National. If the Broadway Park building would have taken this building's approach to balconies I suspect it would have seen less pushback. Not trying to bring that other discussion here but just pointing out that the balconies here are pretty great by comparison. Of course, you have to be willing to sacrifice square footage. Why is that such a big deal? I've never noticed issues with AA not having balconies. I highly, highly doubt if Broadway Park is approved you are going to see people complaining about AA not having balconies and the Broadway Park Building having them. I think it's just a petty argument and they are trying any little thing they can to stop this from happening. If not for the balconies it would be something else. If it truly was the surrounding area that is the problem, than explain Chase and they tacky parking garage Rick Dowell built. I said I'm not trying to bring that conversation here. Go post in the Broadway Park thread if you want to continue it. The point is that these balconies are pretty excellent. They are indeed excellent balconies. They're also for high-end condo development and will never serve a commercial purpose. Recessed balconies are not exclusive to the wealthy, or to residential. Stop making silly statements to advance an argument in an unrelated thread. Balconies that are 2 feet deep *are* exclusive to residential, or at the very least, private balconies. If I'm not mistaken a restaurant is going on one of those floors...all of the sudden they need 6 at least feet of space between the wall and edge. To ask them to take a wall back 4-6 feet is unreasonable. One example sacrifices 8-10 square feet and the other 80-100. It happens every day in real life. Taking exception to balconies overhanging public right of way is not unique to OKC. Can you explain the issue most people have with overhanging balconies? I guess I see them as an asset that brings life and eyes to the street, and I've generally found overhangs as providing a benefit to pedestrians below. Again, I'm sure I'm missing something, but I don't understand the balconies complaint still. This is a big issue in New Orleans right now. They just started charging an "air rights" tax on any balconies overhanging the right of ways. Not sure if it is only for new construction or for existing structures, but as you can imagine it's creating a major stir down there...lots of balconies that fit that description, especially in the French quarter. What Was where Henry Hudson's Is?